First, Apple is trying to take the product across the Chasm. This brings up a case when companies take steps to push its product across the chasm. When this happens at a normal pace in the technology world, the mavens act like an important force to enable this push. But when companies try and force this by measures like price cuts, they are always taking the risk of loosing the support from the early adopters. For Apple, the risk was relatively low because of its track record of creating design geniuses over the years and the die-hard loyalty of the customers. Second, Apple is trying to increase the number of early adopters. If you see the potential size of the cellphone market around the World, having a million users for your product is not even scratching the surface. So one way to look at this is the early adoption base that Apple is trying to create in order to have a more profound force to take it across the chasm, may be in a few years. I am more willing to go with the latter argument. It is true that Apple iPods have been a massive success and people pay a considerable premium to buy one of these. But when it comes to cellphones, the ballgame changes a little. We are looking at a two year contract with a minimum of $1200 for cellphone plan over this time. More important, we all know that in these two years, the iPhone and the likes would have taken at least a few major jumps both in terms of design and features, and the early adopters will not be able to move to the newer device till the contract ends (just look at an iPod from two years back and compare it to what is offered today). So I think it is a good strategy for Apple to get as many happy early adopters with it as possible so that when it comes out with the next version of iPhone in more models and variations to target a bigger market, it gets enough push from these mavens to cross the chasm. Now that the dust has settled a bit on the $200 price reduction on the much popular Apple iPhone, I think we should give it another look, from a slightly different perspective. Apple’s move caused a massive uproar from the early adopters. But price reduction is not something that happened for the first time. Cellphones get cheaper every other day, sometime even reaching negatives. So what was so special about iPhone? I think it was the differentiating factor, and Apple took that away from its early adopters by making the iPhone considerably affordable. Apple early adopters are the group of people who are willing to shell additional dollars to get their hands on the latest Apple product, before the masses start adopting it. It is that virtual cult membership that gives them a sense of satisfaction and pride, to say the least. Now when the price conscious buyers got a hand on the iPhone after the price reduction, helping Apple to reach the target of selling 1 million iPhones by September, this cult pretty much dissolved in less than 12 weeks. Apple tried to calm down the early adopters, its maven community, by giving a $100 store credit. Though it did make some early adopters happy, but for some reason, I think Apple did not hit the bull’s eye this time around. The basic thing that Apple did not fix with this move is the disappearance of the differentiating factor for the cult. How Apple could have fixed it even better? By creating that differentiator, or should I be more clear by saying clearly identifiable differentiator. It could have been an exclusive screen saver or wallpaper on iPhone, an exclusive set of ring-tones only to be available for the early adopters, a couple week early availability of the new apps coming out on iPhone or something else. Though this won’t have discounted for the $100 store credit, but the additional set of bells and whistles would have kept the loyalty of the “very” early adopters more intact. Selling commodities is hard, or should I say, selling anything as a commodity is hard. But what is a commodity when it comes to marketing? Is water a commodity? I think we have discussed this extensively in the past, so let’s move on to something else that looks like a commodity. How about coffee? Coffee is something many people need as the first thing in the morning. But then you put down $4 for a cup of it at Starbucks when you can clearly get it much cheaper at other places, let alone making your own coffee at home. This clearly throws it out of the commodity category. Why are basic things like water and coffee not treated like commodities anymore? I think it is because companies like Fiji Water, Evian and Starbucks have very successfully applied the skill of “de-commoditization”. Anything that is treated like a commodity can be moved out of this commodity bracket with the help of marketing principles used by these companies. All you need to do is make your product as attractive as possible and differentiate it from the lot. Whether it is by calling your bottled water as Artesian water and importing it from a far off place, or by finding tongue twisters to the name of your coffee and creating an atmosphere in there as cosy and comfortable as possible. Let’s take something that is marketed as a commodity and play with it to de-commoditize it. How about rice? Let’s try and de-commoditize rice, theoretically (I am not saying it is an easy thing to do. We all know that it took lot of hard work for the likes of Evian and Starbucks to master de-commoditization. We will just think out-loud and put some ideas on the table for the sake of this discussion). Rice is a food product, so like any other food product, we need to bring in two factors into consideration – purity and health – while marketing our brand of rice. Talking of purity, some things that come to mind are things like how it is handled, packaged, added coating and so on. As far as health is concerned, things like fat content, impact on cholesterol, organic production and healthy for heart are some factors that appeal most to the customers while making a buying decision. By advertising and marketing this product around these factors, we can create an impact on customers, hence persuading them to go for this brand of rice. In order to add the final push, we need to take packaging into account. This is something that is super important as well. Aren’t you wowed seeing the iPod packaging? Aren’t you excited to open something that is packed with lots of artistic integrity? So to add value to our product, let’s create an attractive packet for it with option to preserve the packet after using it or keep using it on an ongoing basis instead of emptying its content in a box. By differentiating your product by using aspects like purity and health, and making it attractive using a unique packaging, we are now selling something that is much more than just a packet of rice…so what is it? It’s faith, health and purity being sold in that packet which contains a byproduct known as rice! The point here is that it is not important what product you are trying to sell, what is important here is how you are selling it. Doesn’t matter how common or how lack-lustrous (you think) your product is, you can make it cool and attractive. Just think about it…if water, coffee and eggs can be de-commoditized, then your product or service can as well! Warehouse store organizations like Costco and Sam’s club run their stores on a business model where they restrict entry to the stores to members only. Members (for those you don’t know) are the people who pay an upfront membership fee ($50 a year at Costco) to get a permit to buy products in bulk from their stores. How does this work? Before we talk about how this ballgame is played by the warehouse stores, let’s take a look at some quick facts. First, Costco and the likes have more than 70% of operating income from the membership fees. Second, due to the upfront membership fees, these stored have very less long term debts. Third, the warehouse stores, which sell in bulk packs have significantly less choices for their customers as compared to other stores like Krogers and Walmart. So how do customers fall in this trap of paying upfront for shopping and living with less than normal number of options? While shopping at these stores, the customers find things cheaper than at other places. There are few main reasons for cheaper products, or this perception of customers. First – bulk packs. By selling everything in bulk, the product manufactures save on packaging costs to some extent and that makes these goods cheaper as compared to individual selling cost at other stores. Second – in-house branding. Costco, to be specific, carry lot of products under their in-house brand named Kirkland. These Kirkland branded products are normally cheaper than the same products of other brands. Costco saves on the advertising expense on its brand and pass on some of the savings to the customers. Third and the most important one that creates a perception that products are even cheaper than they really are is the membership fees. No customer takes into account the membership fee they paid upfront when they compare the price tag of products at these stores to the price tag at any other place. Another reason a customer goes for warehouse store membership is to get a feeling of being an insider. By getting that membership card and getting access to these large stores, they feel like they are part of something like a cult, which in this case is a really big group. This also creates a repeat customer footfall like nothing else. It is observed that normally a person ends up buying more at warehouse stores as compared to what they would at a regular store. Cheaper products is definitely a reason for this, but I think that’s not the only reason. Another reason, which is not that obvious, is the urge to utilize the upfront membership fee as much as they can. People think that since they already became a member, it’s better to utilize it by buying more. Initially this model of paying money upfront to buy an entry card to shop at a store sounded very wierd to me, but after trying it for one year at Costco and buying those Kirkland branded product for “less”, I was too much used to it and like most customers, renewed the membership. I have criticized the brand extension of Amazon.com for selling things unrelated to books sometime back. Since then, I have spent quite a good amount of money buying books from Amazon and the stock price of AMZN has increased 200%. So what exactly is working for the dotcom giant? In a couple of words: extensive personalization. When I as an individual go to Amazon.com, it still comes up primarily as a bookstore. Yes they do have a link to 42 product categories they sell, but the first thing I see there is a list of books related to my taste as a reader followed by a list of bestsellers, and then some seasonal stuff like in October, Halloween story books and costumes followed by anything else like promotional products. To compare visually, this is the first thing I see when I am at Amazon.com (note that I have not securely logged in, it is based on the information stored in Amazon cookie on my machine. If I purchase something, before checkout I will have to log in to my account). 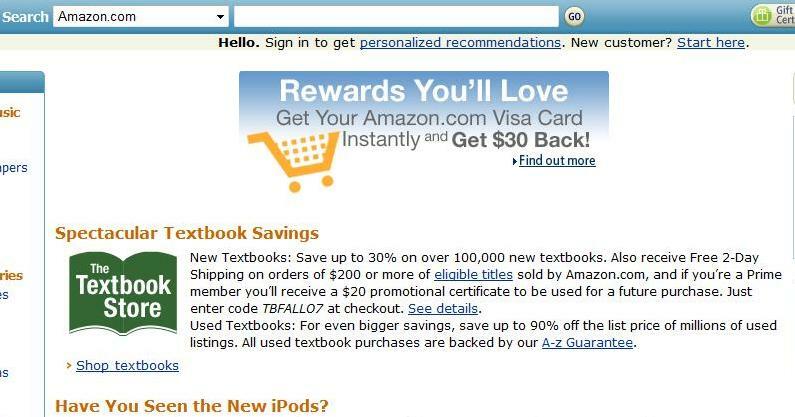 And this is what any new user sees on going to Amazon.com at the same time. The two pages have remarkably different content because my landing page is personalized for me based on my shopping history and activity on Amazon stores, while the other one is for generic user. Similarly, if you look at the landing page for any other user, it will have a completely different content based on their interest. Amazon is a standout example of how you can do brand extension in unrelated fields if you concentrate on each customer as an individual and provide them with what they are looking for. Amazon uses technology to its benefit by empowering the site with a search box right at the top to help you find what you are looking for instantaneously, and hence taking you in a whole new world where you will find Amazon.com as a completely different store. If you search for kitchen appliances, Amazon will turn itself for you as a kitchen appliances store, and same for anything else. The crown jewel of Amazon is recommendation engine. No one has got this one thing as well as Amazon did. This engine helps Amazon take individual customization to the next stage. As for the stock price, I have a slightly different theory. With the Internet boom and bust settling down and the web becoming more ingrained in the life of the masses, the analysts have started comparing Amazon and the likes to the brick-and-mortar stores. This instantaneously gave a kick to Amazon because they can sell a lot more than any brick-and-mortar store, or many of these stores taken together, because for one, they have a global presence, and next, they don’t have to maintain shelves and window displays like the physical stores. Amazon does maintain a real state on its website, but that is customized for each individual customer. Just compare going to Sears stores with shopping at Amazon. At Amazon, it might take you less than a minute to find what you are looking for, while at Sears, it might take you 10 minutes to reach the end of store where you will find what you are looking for. But then there are some natural advantages at Sears and other physical stores like customers can touch and feel stuff, customers go to buy one thing and finds something totally different at the store and buys it as well and so on. With the help of software, the likelihood of Amazon filling these gaps is much more than Sears filling the voids like personalization and a near infinite inventory at a physical location.